I am a life-long city dweller. I went to the zoo. I went to the beach. Every once in a while I sat under the shade of a an oak tree and enjoyed a picnic, but it wasn’t until I went to college and studied biology that I began to appreciate how interconnected we and the ecosystems around us are. What is the importance of a midge? 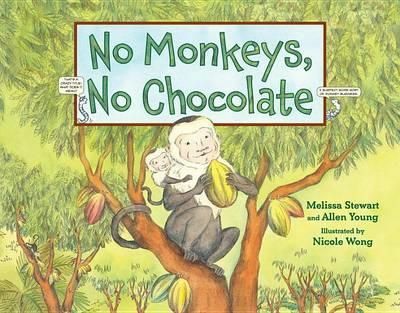 No Monkeys, No Chocolate, a non-fiction picture book written by Melissa Stewart and Allen Young and illustrated by Nicole Wong, strives to answer this question along with a few others. 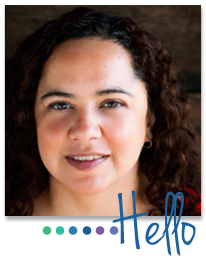 The picture book is layered. The large print takes us backwards from chocolate chip cookies, through the multitude of steps that eventually provide the chocolate we use to make chocolate chips. Animals that we rarely give a second thought to play a major role in the process. Without midges, maggots, leaf cutter ants, lizards, and of course, the title characters, monkeys, we might be chocolate-less. The smaller print provides details about each step in the cocoa creating process. Down in the corner are two worms who act as tiny M.C.s of the story. Since it is a non-fiction picture book, the illustrations are realistic. Children who are reading the book will get a sense of what the real animals and plants that play a part in the story look like. Not everyone gets to go deep into a rainforest and observe the interactions between plants and animals that make our world possible, but this book is a great virtual journey and a great way to show kids why they should care about nature.